- Widely used in kitchen for washing vegetables and utensils. Owing to our expertise in the concerned domain, we are engaged in manufacturing and supplying a wide range of Vintage Sinks. - Provided with a stainless steel tap. - Broadly used in kitchen for washing vegetables and utensils. We present our esteemed clients with the superior quality Stainless Steel Single Bowl Sinks. These Stainless Steel Single Bowl Sinks are made out of high grade sturdy steel. The Stainless Steel Single Bowl Sinks that we offer have perfect finish and are designed as per the international standards. We r leading manufacturer & exporter of border tiles, step riser, kitchen sinks, and luxurious highlighter also. Subham sinks have a specially designed surface that is easy to clean and maintain. No need to use hard scrubbers or harsh detergents and acids; just a soft cloth and soapy water will do. 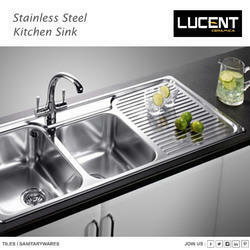 Assuring a new and sophisticated look to the kitchen, we bring forth Stainless Steel Kitchen Sink. Our Stainless Steel Kitchen Sink has elegant appeal and finish and therefore it has received high appreciation from the clients. 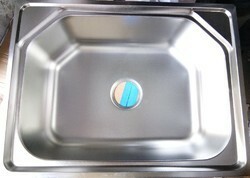 Our Stainless Steel Kitchen Sink has adequate space to assure you comfortable washing experience.